FILE - A general view during the 14 Hands Winery Juvenile Fillies race on day two of the 2016 Breeders' Cup World Championships at Santa Anita Park on Nov. 5, 2016, in Arcadia, Calif.
A task force will investigate the recent deaths of horses who suffered fatal injuries at historic Santa Anita Park, according to the Los Angeles County District Attorney's office. Twenty-three horse deaths have been reported at the track east of Los Angeles since December. Santa Anita had been closed to racing for most of March in response to the deaths, but resumed racing this month. "I have formed a task force of experienced deputy district attorneys and sworn peace officers with varied expertise within my office who will thoroughly investigate and evaluate the evidence to determine whether unlawful conduct or conditions affected the welfare and safety of horses at Santa Anita Park," Los Angeles County District Attorney Jackie Lacey said in a statement issued Tuesday. There have been 23 horse deaths at the track since Dec. 26. Santa Anita officials previously announced a series of measures implemented to help bolster safety of the horses. Earlier this month 5-year-old Arms Runner stumbled on the Arcadia' track's hillside turf course at the point where it requires horses to briefly cross over the main dirt track. The horse suffered a fatal injury to his right leg. Tim Ritvo, chief operating officer of Santa Anita parent company The Stronach Group, told the Daily Racing Form the track will suspend races on the hillside turf course to "look at data" in the aftermath of Arms Runner's death. In a letter to the California Horse Racing Board, Sen. Dianne Feinstein, D-Calif., called April 2 for racing to be suspended at the track "until the cause or causes of these deaths can be fully investigated." The CHRB had been set to meet last week to discuss the possibility of relocating races away from Santa Anita, but the meeting was scrubbed and the discussion of Santa Anita racing is instead set for the board's meeting Thursday at Santa Anita. Moving races away from Santa Anita would require approval from the track's owners, The Stronach Group. 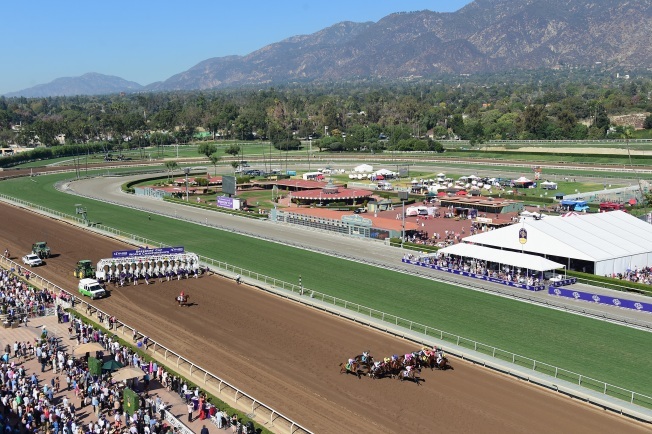 Ritvo told the Daily Racing Form that Santa Anita fully intends to maintain its schedule of racing through the end of the current meet on June 23.